To nurture a child’s innate curiosity through exploration and play. Now accepting applications for 2016-17 and 2017-18 Three Year old Tues/Thurs Classes as well as 2017-18 Four Year Old Mon/Wed/Fri Class. 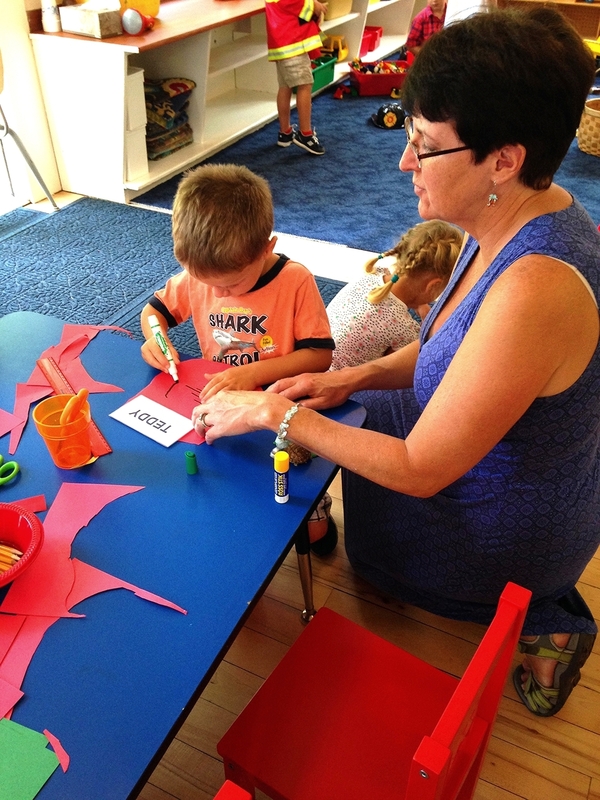 First Meeting House is an independently owned and operated nursery school located in a bright, sunny room in the Parish House of the Old North Church building. In addition to the main classroom, our facilities offer a natural outdoor garden/play space, kitchen facilities, and use of a large recreation hall. We offer a two-year program aligned with the public school calendar: September-June. Children must be three years of age prior to September 1st to be considered for admission. Our class sizes are small, no more than 14 children with three consistent teachers during the first year, and two during the second program year. First Meeting House is licensed by the Massachusetts Department of Early Education. A child’s “work” is PLAY. Through play, children build competency in all areas. Three year olds are moving beyond parallel play and are learning how to engage their peers. Four year olds are getting ready for the rigors of Kindergarten. Sharing, taking turns, asking for a toy and waiting are important skills that children develop through play. Children use their imaginations and work through problems through play. They “try on” different roles and expand their knowledge. Children are naturally inquisitive. We provide opportunities for discovery. We incorporate nature into every day. Children develop confidence and resiliency through play. They create bonds through their friendships, learn to separate from their parents and become self-assured with their new sense of independence. Children develop fine and gross motor skills through play. From “decorating the cake” in the kitchen to pushing the dump trucks full of blocks across the room, children are using their bodies and building their skills. SALLY B. SANDS, M. ED. jennifer dunklee berardi, M.ed, B.A. "A child’s first school experience lays the foundation for future social and academic success. By providing a multi-facetted classroom and natural outdoor space, we give children the freedom to explore and grow." Indoor play and activity space. Sand table filled with monthly subjects of study. Area of immersive subject matter, in this case Dinosaurs. First Meeting House provides comfortable surroundings where young children enjoy new experiences with new friends in a cooperative learning environment. Areas of the classroom invite children to participate in dramatic play; skill building through blocks and legos; art activities; table top projects; early reading activities and book sharing. We plan our classroom activities, materials and space to support each child's social, emotional, cognitive, creative and physical development. Our small class size allows teachers to observe each child as an individual and facilitate their continuing growth and learning. The daily program consists of alternating periods of individual, small and large group activities, structured and non-structured time, indoor and outdoor play in a nature-rich environment.